This week the new leadership team of EELRCA was to meet in Garoua Boulai with Willie Langdji, ELCA’s Regional Representative, and Thore Ekland, Representative from Mission Afrika (Denmark), and me. That didn’t happen. Road bandits. Again. You may remember that the partners’ consultation was cancelled in November for the same reason. Still, we were so hopeful because from December 2014 through early May 2015 there were no problems on the road. Small business people, travelers and large trucks passed with no problem. It is true that the large trucks generally went in a convoy with some troops from the UN, but no sight of the bandits. The second week in May there was a forum in Bangui to try to resolve differences, encourage disarmament, etc. Representatives from 10 “rebel” groups were there. They agreed to a cease-fire and agreed to release child soldiers (and some were, in fact, released). It is true that elections were pushed back again (until the end of 2015), but I was hopeful when I heard reports of the forum. It seems that the road bandits were not happy with the outcome of the forum. They are again stopping cars and motorcycles to rob them. They have also shot at cars and burned a few. Are these the same bandits? Probably. Are there some from Bangui who were not happy with having to disarm? Maybe. The result is that although some cars and trucks are passing on the road, there are many fewer. It maybe be that there is a problem only 15-20% of the time, but no one knows when the bandits will attack. So, I won’t be taking that main, paved road anytime soon and neither are the Central Africans with whom we work. Sigh. Here’s a calm, pastoral scene from Baboua (at the Theological School in April 2015). And, a scene from Bouar of a bridge that is being rebuilt (also April 2015). (There is a lot of construction and improvements in Bouar, Bohong and the villages in that area.) Progress! Willie and I would still like to participate in the transition retreat with the new EELRCA officers. (Unfortunately, Thore has to go back to Denmark.) How do we do it? Well, there’s more than one way to skin a cat. (Where does that gruesome phrase come from???) We take the long way. I will drive to Yaoundé. Then Willie and I will take the train to Douala and catch a flight to Bangui. From there we’ll catch a UN flight to Bouar. All safe! But, instead of a 3-hour drive, it will take me 3 days. I am willing to sacrifice the time for the safety! And, while we are in Bouar, we will be able to attend the installation of the new officers and meet with the Conseil d’Administration (National Church Council). Should be fun. As will be the return trip which will reverse the steps listed above. So, the long (safe) way to Bouar. 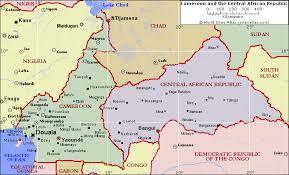 And, it seems, the long (frustrating) way to peace and stability in the Central African Republic.